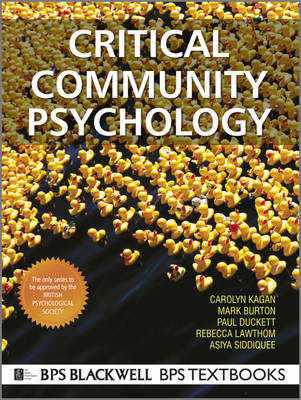 All the authors are members of the largest community psychology team in Europe, practising and researching community psychology and teaching undergraduate and postgraduate courses in community psychology at Manchester Metropolitan University. Mark Burton, Visiting Professor of Health and Disability at Manchester Metropolitan University and Head of the Manchester Learning Disability Partnership: I have a background in both psychological research and clinical psychology, and have worked for the last 20 years in services for intellectually disabled people as a development manager, using a community psychological approach to inform this work, which is carried out by myself and by colleagues with both psychological and non-psychological backgrounds. I have also participated in the work of a variety of non governmental organisations and campaigning groups. I have taught courses on social theory and psychological practice, organisational and social change, action research and aspects of community clinical psychology both at postgraduate level and outside the University context. Paul Duckett, Senior Lecturer, is a community psychologist who works in the fields of disability, mental health and unemployment. I work alongside disabled people including people with mental health difficulties and people with learning difficulties. I am interested in exploring ways of promoting student mental health and promoting the integration of a social justice perspective in psychological teaching, research and practice. In addition I have published in the areas of criminal (in)justice, children's wellbeing and social critiques of war. Carolyn Kagan, Professor of Community Social Psychology at Manchester Metropolitan University: I am a community psychologist with a background in social psychology, counselling psychology and social work. I am a founding co-editor of the international journal, Community, Work and Family (published by CARFAX, now Taylor and Francis). I have worked for 25 years on projects in the community, with disabled people, their families and services and with people living in poverty. Much of my work has been action oriented, with projects extending over several years, and I have been involved with the establishment of new projects and new forms of community organisation. I teach Community psychology to both undergraduates and postgraduates, and have developed the first UK Masters programme in Community Psychology. I have supervised and examined MSc and PhD theses in community psychology in the UK and Australia. I convened and chaired the 1999 UK Community Psychology Conference in January 1999 and am a regular contributor to UK and European community psychology conferences. Rebecca Lawthom, Principal Lecturer. My research interests centre on gender and feminism, particularly in workplace settings. I am also interested in working with other non dominant groups, including disabled people, and in relation to social inclusion approaches. Ihave a particular interest in the concept of 'communities of practice' and am currently exploring its utility in relation to narrative work and to different forms of creativity. Asiya Siddiquee, Lecturer. I am a community psychologist with a particular interest in critical perspectives on established forms of both quantitative and qualitative research. My recent doctoral work was 'A Community Psychology Approach to Investigating the Impact of the Internet', and as part of this I examined the impact of the Internet on refugee women, ethnic minorities, community development workers and the health sectorI am currently applying action research processes to explore issues such as marginalisation and the use of the digital technologies, and am part of an international community psychology virtual network. Other, newly appointed members of the team may also contribute to the book. For example Professor Dan Goodley (expertise- critical disability studies) and Jenny Fisher (expertise - community development).